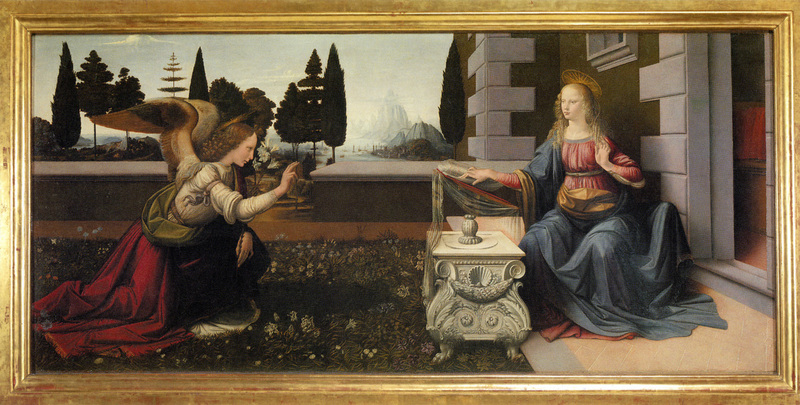 This info is translated into English from "Let's solve the enigma of the earth"
I was told through the channeling that the picture of Annunciation was not drawn by Leonardo da Vinci but he gave the direction to the atoms of oil painting. The atoms of Stone god which wanted to show this shape turned into the particles of colored paint of oil painting and showed the shape. Though the atoms(element) of the soil expressed the shape of the mural in Egypt, the atoms of Stone gods wanted to show about Stone humans with more beautiful color in the thinner form and remained in the form of the picture. 1) The blue mountain(= The blue mountain in the center) show the death by the blue color and it showed the Stone god whose shape is the mountain had been dead. It is the familiar shape with the Stone god of big mountain, alter ego of middle size and the giant of small mountain. The small bars standing around the blue mountains are the giants(Stone humans) of Stone gods who turned into the standing stones later. The left winged Stone woman is telling to the woman who is the incarnation of queen of Sagittarius that Stone gods that became the mountain over there were dead. 2) The right arm of the right woman is abnormally long. The right arm show the work of the world of subconsciousness. The long right arm show the work of subconsciousness world is bigger than the work of the real world. As the atoms of the paint which turned into the shape were able to show their beat of their own, they were not able to balance. 3)The loop over the head does the role of the receiver, because Stone humans worked by getting the direction from the star and so to speak it takes the place of the brain. 4) There were actually Stone humans with wings and they played the role of liaisons. Two Stone humans turn their palms against the another and send and receive consciousness with palms with each other. There are lots of scratches in the walls of caves in Petra and Turkey. Because Stone humans with wings lived there and they put scratches on the still soft body of the caves made of Stone gods. 5) The table which looks like strange animal can be seen in the center. It is Stone human(?) who played the role of the desk and it had consciousness and was able to move. That shows it was a robot of Stone humans. The juice is in the pot on the table. The cloth which looks like the thin georgette is made of the juice and the desk of the robot is covered so that it won't be dried. 6) You can find white alternate rectangle stones behind the right woman. Sirius taught to become like this. White means good and rectangle means Sirius. Though those rectangles are drawn lengthwise, they show Sirius devised stone columns. 7)The meandering river in the center expresses the snake(=the Ruler's Star) which means it had solidified Stone gods hiding. 8)The string is wound around the arm of the left woman with wings. It expresses the snake and also implies she was the Stone woman who was dominated by the Ruler's Stars. This picture is also taken advantage of by Christianity. It expresses atoms of Stone gods turned into the shape of humanity in the cave. Stone humans who instruct to atoms are in the wall. Stone humans also lined outside , too. The energy is given and get solidified firmly when newly born humanity passes through in the center of lined Stone humans. It is the road though which newly born humanity who is seen off by the lined Stone humans. This kind of road can be found in other stone circles. #)A mail was sent to me from one of the readers. It tells the thing like a ufo can be seen at the upper left corner of the picture of Annunciation.